In deep shades of yellow, red, orange and yellowish green, stripes and checks find new definition in the handloom panjabis in Abartan's collection for Boishakh. Young, fashionable girls can go for their exclusive range of saris in muslin and cotton. Brilliant execution of appliqué, block prints and hand embroidery embellish these timeless garbs. However, the prime attraction remains attires, either mix-match or in contrast, for couples. Shalwar kameez, sari, panjabi and fatua from Abartan are available in all their outlets at Malibagh, Shukrabad, Mirpur 10 and Wari. #8317896. SHOKHER Hari, poetry, lyrics, and medieval terra cotta- these are some of the inspirations observed in Rang's summer collection for Baishakh 1417. One can find elaborate use of motifs and patterns based on the underlying theme on saris, shalwar kameezes, panjabis, fatuas and t-shirts. Also on offers are accessories- bags, terra cotta jewellery, bangles and others. Available at all Rang outlets. FASHION house Methopath celebrates Boishakh this year with their brilliant assortment of festive shalwar kameez, fatua and panjabi. Made from Norshinghdi handloom and Comilla khadi, intricate embellishments adorn these fabrics. Keeping the ensuing summer in mind, the selection of the fabric has been primarily to cater to user's comfort. The colour scheme has been festive, but also in summer colours keeping in pace with trends and the changing seasons. CONTEMPLATING on the rich history and tradition of terra cotta designs, that began all the way in China almost 200 years ago, Nogordola derives its inspiration for Boishakhi designs from motifs featured on Radhagobinda Temple at Putia, Rajshahi. This season you have eclectic saris, shalwar kameezes, fatuas, skirt, tops, capris, shirt and panjabis. There is also a great selection of children wear to chose from. Shalwar kameezes are priced between Tk 1590-3290, saris Tk 1290-4590, fatuas Tk 590-990, panjabis 690-1590, and children's saris at Tk 990. Rush to Nogordola outlets for your pick. A name not unfamiliar in fashion, Textmart, over the years they have made a niche for themselves with men's wear, exquisite saris and flamboyant children's wear. This Boishakh, Textmart goes for an eclectic mix of colours with a careful selection of fabric that is all so important so the hot, humid months ahead. However, their Boishakh attires are something quite extraordinary. Something that will give you the extra edge, make you stand out in the crowd. Head to Textmart for your pick. BANGLAR Mela introduces silk, half-silk, endi, khadi mixed cotton saris to their latest line for Boishakh, which draws inspiration from rickshaw and traditional pitha art. 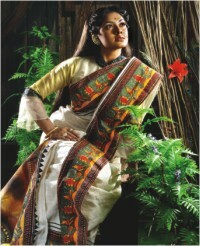 Designs include works on tie-dye, block print, cutwork and karchupi and special colours used that commemorate Boishakh, are red, orange, yellow, limes, etc. aside from saris, the line also includes kameezes, fatuas, panjabis and children's wear. To celebrate Boishakh, Aranya has created a vivid range of reds, yellows, blues and greens from nature. Hand-woven silk and cotton endi and khadi have been supplemented with light summer wear blended on fabrics for the festive season. Prints remain the all-time favourite across the board, while the traditional kanthas and jamdanis are for those memorable special occasions. Colourful handloom textures and prints make up a wide selection of ready wear for men and women. These are accessorised with scarves, block printed and tie-dyed in shibori and other regional techniques, to complete the outfit. This Boishakh welcome the New Year in Aranya's unique collection and stand out in the crowd. POHELA Boishakh, especially after the turn of the Bengali century, has transformed into a celebration of joy within the hearts of the people. As we prepare to welcome the coming of Bangla 1417, boutique Kay Kraft puts on a festive garb, bringing forth an array of new attires in bright designs and bold cuts- Boishakh Collection 1417! The saris have witnessed the reinvention of some timeless patterns and motifs; the use of alternative colours that are all the rage this season. Elaborate use of motifs from ancient Greek civilisation and Islamic patterns have been mixed with trendy floral designs. 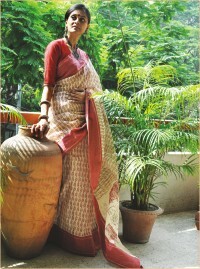 Tant saris have been revamped with hand block prints, appliqué and screen prints. Hands down, saris are the pick of Boishakh but for those who care for a different look, KK's excellent offering on the wide range of shalwar kameezes is something quite extraordinary to look out for. Use of natural fabric and organic dyes make these attires vibrant, and a testament to the festivities. 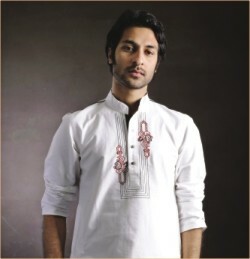 Panjabi for the deshi men is simply quintessential. Kay Kraft has undertaken elaborate arrangements in presenting the panjabi selection of their Boishakhi Collection. Primarily cotton, endi and silk fabrics have been used as 'canvas' for accessorising with geometric kanshi and satin stitch. Colour schemes witness the use of soft colours, while bright formal shades are also present for those seeking something for the evening party. This however does not see an end to the boutique's Boishakhi offer. Also available are shirts, tops, fatua and children wear. Rush to the nearest KK out let now! ANDES is going all out for Boishakh celebrations this year. Aneela Haque's Boishakh couture collection features not only a vivid red - the signature colour of Boishakh - but shoppers are also unlikely to be disappointed to find the vibrant colours of orange, yellow, green and blues complementing the white and black. The women's collection boasts an array of both eastern as well as western wear. The eastern collection includes three-piece cotton kameezes, graphical and colourful cotton sari as well as crepe silk sari. Also available are unstitched pieces and stitched trendy blouses and what would Boishakh be without the traditional jamdani saris? For western wear, Andes is not only offering a wide range of trendy fatuas but also eye-catching tops and skirts to be accessorised with draping scarves, bandanas and bags. Andes is also displaying an impressive jewellery collection this time. Recognising the trend of ethnic jewellery, they have tribal-beaded necklaces and bracelets along with the classic silver and glass-beaded pieces. Not to be singled out, Andes has also included men and children's fashion into their collection. 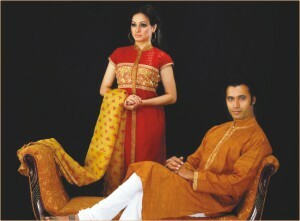 In men's fashion, you cannot go wrong with any of the traditional panjabis or the hip fatuas and formal evening wear. The children, though, are especially significant in this collection as Andes attempts to make them a part of their unique collection through fancy shalwar kameez sets and fatuas. The store is closed on Sundays and is open every other day from 10 am - 8 pm.